After my night account to the Intan in January, I had the privilege of visiting this private museum again twice over the last two months under the kind invitation of its owner, Baba Alvin Yapp. 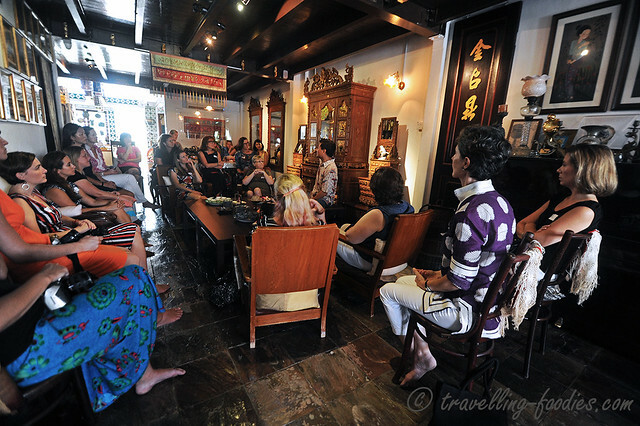 I had the chance to experience the guided tours led by Alvin and even interact and share with some of the tour participants what little I know about the Peranakan culture. So it was quite an experience for me on many accounts! As one steps through the doors, one would naturally be overwhelmed by the physical grandeur of the large altar tables complete with the various artifacts on it, as well as the sheer majesty it exudes. It was most certainly so during my initial visits to this private museum and the feeling remains pretty much so even till today. Under natural light, the true beauty of the piece is revealed, intricate carvings and ornate figurines, gilding and patina et al. Another piece which I really like is the sideboard which encapsulated the essence of Peranakan culture in a single piece of furniture. 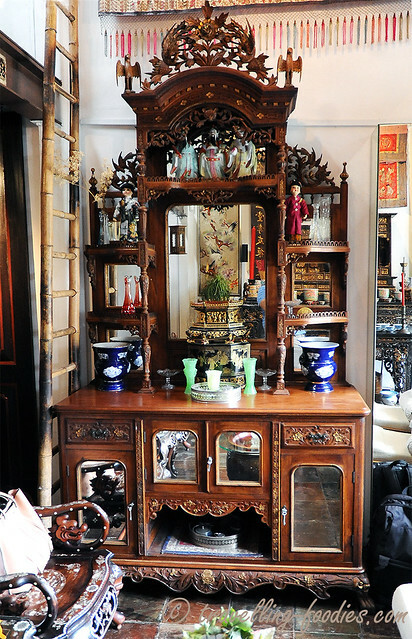 The structural form of the sideboard is largely European but one will be quick to find typical Chinese elements on it like the phoenixes and peony carved to form the highly ornate crown, to bats (蝠）, complete with stylised wings carved out of the sprigs of flowers and leaves, which are homophonous to “good fortune” (福). One can easily observe similarities to styles favoured by the local Malay community on this piece as well, through the exercise of floral and foliage motifs found throughout the whole piece. Flanked on the other side of the upper floor, one would find some smaller and quaint-looking pieces which are no less interesting. From a cloth-hanger with ornately carved crowns to a dresser with elaborately embellished woodwork on the skirting and legs, all these pieces are now used to display the Intan’s vast collection of beaded slippers and shoes as well as porcelain Alvin has collected over the years. Gorgeous pieces of brown and gold wardrobes which have been converted into display cabinets for the extensive collection of nyonyaware from kamchengs to chupus and teapots, as well as embroidered and beadwork pieces from purses to clutch bags and belts. 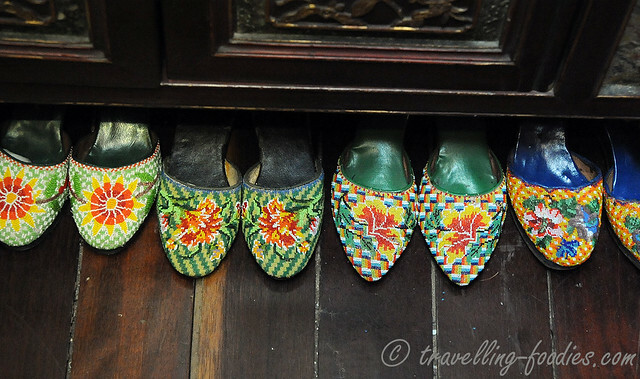 Tucked neatly beneath the cabinets are rows upon rows of kasot manek, otherwise known as beaded slippers, with a large variety of forms from closed to open-toed, from tapered tips to rounded ends. They bear a plethora of motifs from floral to figurines, with creatures both real and mythological! A Penang red and gold dresser which doubles up as an altar table overlooks the front of the upper floor, flanked by large candle-stands, floor spittoons together with large red and black wedding baskets called bakol siah. The first group whom I’d joined in February was around half a dozen or so French-speaking docents from the Asian Civilisation Museum and Peranakan Museum. 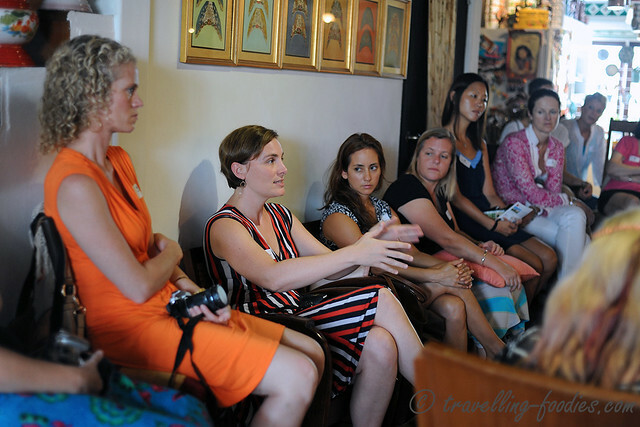 Many of these ladies are the spouses of French expatriates working in Singapore. They signed up and were trained by the National Heritage Board to serve as volunteer guides for our museums. Some of them even paid their own expenses for the course, out of sheer curiosity and love for our local culture. Truly remarkable and commendable! The docents were led to the upper floor where they were given a recount of the various artifacts in a typical baba home. Alvin providing an insightful account of how kebayas were made and worn in the past, explaining the details on old pieces which are hardly seen nowadays on the new ones. I could see that the docents were thoroughly engaged, in awe at times and bemused in others… but in a good way! Despite being already trained by the NHB, nothing really beats a detailed walk-through of artifacts to get to know them better at first hand. Void of physical barricades like glass panels and cordon ropes, the artifacts, like this embroidered knee pad could really be admired upclose and personal. If you are lucky, you may even get to touch it! And as with most (ladies), the eyes are set on the display of kasot manek on the floor and cabinets in every colour and design thinkable. 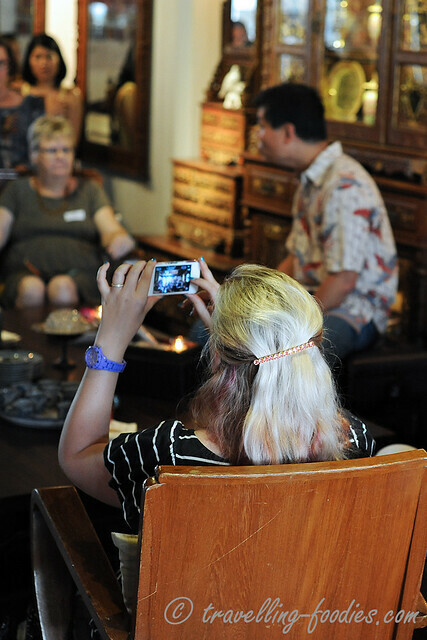 The tea session at the end of the tour also saw another intense round of questions and discussion, particularly on the relevance of the Peranakan culture in light of modernity. Concerns on the sustainability of the various customs and practices were also raised from the occasional ceremonial and ritualistic, down to everyday use of the Baba patois. I enjoyed listening to the exchanges tremendously, despite not contributing much to the discussion. 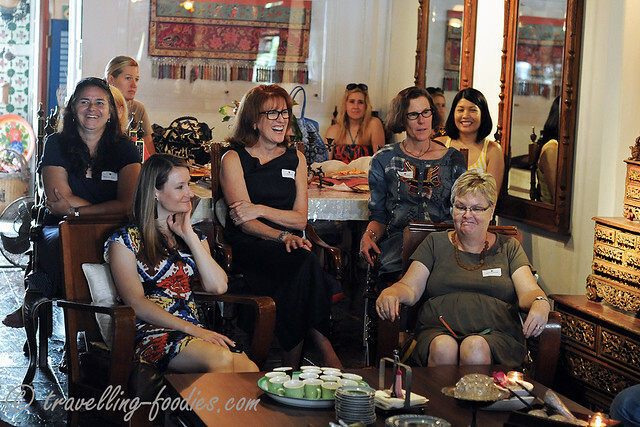 It is always interesting and insightful to learn about the perspectives and impressions which others may have, particularly from these expat ladies, some of whom have taken a different view of the various topics discussed. The other group I’d joined in March just last week was with the ladies from the American Women’s Association of Singapore (AWA). The group was considerably bigger, around 25 of them so they was divided into two with Alvin leading one and me the other! The introduction started with a series of questions that were thrown back and forth between the participants and the guide. Like the French-speaking docents, a certain level of interest seems to revolve around the usage of Baba Malay in our modern households and the level of fluency and proficiency the current generation of Peranakans have for it. Understandably so, as the language truly lies at the heart of each culture, holding and gelling the other components together. When the tongue ceases to be spoken, it seem invariable that the disintegration of the social and cultural fabric would follow suit, perhaps survived by the maintenance of a handful of fragments and in the case of the Peranakan community in Singapore, its cuisine and material culture. But not all of it bears a serious and solemn note. There too were lighter moments of joviality and laughter! In fact most of it were! As the group broke into two, half of them were brought upstairs by Alvin for a tour of the upper floor while I took care of the second group through the various artifacts in the main hall. Needless to say, these colourful Czech-made tiffin carriers called tengkats caught the attention of some of the visitors who were curious about the context of their usage. Another artifact that drew quite a bit of interest and curiosity were these beaded pieces seated on glass plates on the main altar. These are in fact the holders for kueh bakol, a Peranakan sweet which was commonly offered to the gods and ancestors as part of worship. 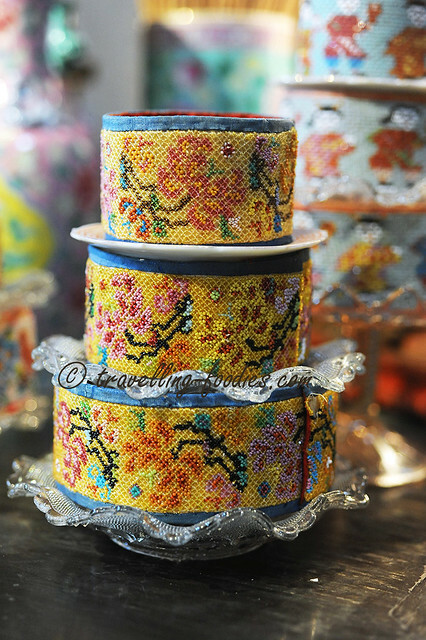 These kueh bakol holders, which are probably of Indonesian Peranakan origin, reflects the highly decorate and ornate lifeystyles the Straits Chinese led in the past, who left nothing to look plain and drab. The technique involved was also of interest to some of these ladies as it involved threading the beads together compared to the sewing technique. The former is not unlike what is used by the native American Indians for their beaded artwork. Some of the participants were also quick to notice the distinctions between the Peranakan wax paper lantern vis a vis those found in more traditional Chinese households. These “jee hoh” lanterns usually depict the surnames of the family who resides in the house from which these lanterns are hung, and sometimes even bear clues to the trade or business the family is engaged in through the motifs and wording used. Apart from the words, jee hoh lanterns can also be differentiated by the highly sophisticated drawings of various animals, flowers and deities done on them, a dying artform with very few surviving practitioners left within the Peranakan enclaves of Meleka, Singapore and perhaps Penang as well. The tour wrapped up with a session of Chinese tea accompanied by a selection of sweet and savory Peranakan kuehs like kueh lapis beras, kueh dadar and rempah udang. And finally it was time to say goodbye, but not without a group photo of course. I hope that the tour was both enriching and enjoyable for the ladies from the AWA. It was most certainly for me. 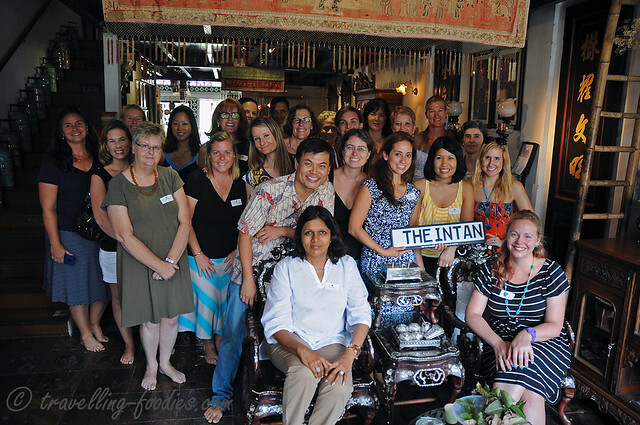 For more details on private guided tours at the Intan, kindly visit their website for more details. This entry was posted on March 25, 2014 by Alan (travellingfoodies). It was filed under General and was tagged with American Women's Association, Baba, culture, heritage, Intan, Nyonya, Peranakan, sideboard, straits chinese, tempat sireh.